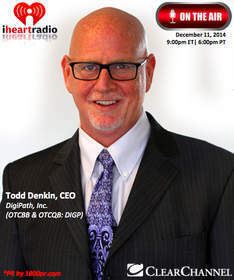 LAS VEGAS, NV--(Marketwired - Dec 11, 2014) - DigiPath, Inc. (OTCBB: DIGP) (OTCQB: DIGP), an independent cannabis testing, broadcast media, digital pathology, and education firm, CEO and President Todd Denkin discusses DigiPath's growth in the burgeoning cannabis industry with Michael Yorba on Clear Channel-iHeart Business Talk Radio's "The Traders Network" Show. "We are leveraging much of the same scientific and medical industry knowledge and skills we employ in the digital pathology market to expand into three new cannabis-related business units," said Denkin. "Our initial focus is on cannabis testing, balanced cannabis news reporting, and cannabis education." DigiPath, Inc., supports the cannabis industry's best practices for reliable testing, education, and training while bringing unbiased cannabis news coverage to the cannabis industry. The Company's four (4) business units are DigiPath Labs, TNM News Corp., DigiPath Corp., and DigiPath University. For the past six years "The Traders Network Show" has been hosted and broadcasted live daily on Clear Channel DFW 1190AM KFXR from 6:30am - 7:30am CT, Monday-Friday. Host Michael Yorba interviews the front-page titans about the latest in capital markets, CEO milestones, trading tools, real estate acquisitions and market trends. It's a fast moving, high-energy show that presents stocks, commodities, bonds, forex, derivatives, real estate, political trends, technology trends, crowd funding and impact investment insights in a new light and keeps audience asking for more... shift your thinking and join us as we deliver "tomorrow's trades today" on iHeart Radio and Clear Channel's The Traders Network Show. To inquire about being a guest on this show, please call 917.409.8211 or email matt.bird@1800pr.com or visit us at www.1800PublicRelations.com. This press release contains "forward-looking statements" that include information relating to future events, and future financial and operating performance. Forward-looking statements should not be read as a guarantee of future performance or results, and will not necessarily be accurate indications of the times at, or by, which that performance or those results will be achieved. Forward-looking statements are based on information available at the time they are made and/or management's good faith belief as of that time with respect to future events, and are subject to risks and uncertainties that could cause actual performance or results to differ materially from those expressed in, or suggested by, the forward-looking statements. Important factors that could cause these differences include, but are not limited to: the in-demand for the Company's products, the introduction of new products, the Company's ability to maintain customer and strategic business relationships, the impact of competitive products and pricing, growth in targeted markets, the adequacy of the Company's liquidity and financial strength to support its growth, and other information that may be detailed from time-to-time in the Company's filings with the United States Securities and Exchange Commission. An example of such forward-looking statements in this press release includes statements regarding the Company expanding into the botanical, nutraceutical, and cannabis industries. For a more detailed description of the risk factors and uncertainties affecting DigiPath, please refer to the Company's recent Securities and Exchange Commission filings, which are available at www.sec.gov. The Company undertakes no obligation to publicly update or revise any forward-looking statements, whether as a result of new information, future events, or otherwise. Public Relations and Marketing by 1-800-PublicRelations.